Services are scheduled for 10 a.m. Thursday, Nov. 5, at First United Methodist Church for Virginia Elizabeth “Libby” Gashwiler Green of Artesia. Green, 109 years and 6 months, passed away Monday, Nov. 2, 2015, at Artesia General Hospital following a brief illness. Monty Leavell and David Prell will officiate at the services, with interment to follow at Woodbine Cemetery. Pallbearers will be great-grandsons Ryan and Jay Turri, Michael Prell, Brandon Haldeman and Clark Driver, along with Harold Green, Jason Starnes and Chuck Morgan. Honorary pallbearers are Sonny Watts, Tommy Brown, Clarence Conner, Jess Briggs, Don Burton and Tom Overstreet. Green was born April 15, 1906, in Novinger, Mo., to Dr. J.S. and Maude Gashwiler. She was the second child of eight. She graduated from Novinger High School and, one year later, graduated from the nurses’ training school at the Grim-Smith Hospital in Kirksville, Mo. She received her RN degree from Kansas School of Nursing in Kansas City, Mo., and did graduate work in St. Louis, Mo. On Sept. 3, 1928, she married Forrest Lee “F.L.” Green in Linn, Mo. To this union was born a daughter, Virginia, and a son, John L.
The family resided in Edina, Mo., until 1945, when they moved to Artesia, where F.L. became a football coach and teacher. Elizabeth was Dr. C. Prude Bunch’s nurse for 40 years, retiring in 1975. The grandchildren fondly remember their trips to the doctor to see Grandma and get their yearly shots. 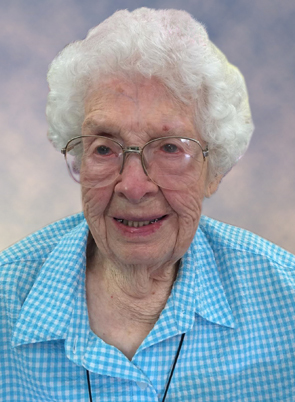 She was very active in the PEO Sisterhood in Missouri and Artesia over the past 91 years. She was also an active member of Chapter J in Artesia and held all the offices in the chapter. She is known as “Mother Green” throughout the PEO Sisterhood and is honored to have her daughter, daughter-in-law, granddaughters and a great-granddaughter following in her footsteps as members of PEO. Elizabeth was very active in many community and family activities. She was a member of the DAR and served as treasurer at age 107. She still holds membership in the Edina Eastern Star. She enjoyed swimming with a group of ladies nearly every day for many years. She also loved doing for others, such as helping deliver Meals on Wheels in her later years. She lived by herself until the age of 107, then moved to Good Life in Artesia, where she enjoyed the company and fellowship of the other people who live there. She loved to cook, and everyone enjoyed her apple pies and chicken and dumplings. She was an avid reader (especially poetry), listened to the radio, and was a true fan of the Artesia Bulldog football team. She also truly enjoyed quilting, needlepoint, crocheting, counted cross stitch, sewing and knitting. The family still enjoys the dishcloths she crocheted for them. grandsons. She loved to visit with everyone and enjoyed sharing stories of her life. She would recite poetry and even recited the entire Gettysburg Address at age 109. A highlight for her was attending her great-granddaughter Brooke’s wedding Sept. 26, 2015, in Ruidoso at the age of 109 years, 5 months. Survivors include her daughter, Virginia Haldeman and husband Vernon, of Artesia; son John L. Green and wife Toots of Alamogordo; grandchildren Richard Haldeman and wife Silvia, Sarah Gromatzky and husband Rick, and Susan Chandler and husband Baron, all of Artesia, Johnese Turri and husband Michael of Black Lake, and Jody Prell and husband David of Carlsbad; great-grandchildren Kelsey Chandler and Jessica Parker of Artesia, Brandon Haldeman and wife Suzzy of Port Arthur, Texas, Brooke Driver and husband Clark of Dallas, Texas, Ryan Turri and wife Rochelle and Jay Turri and wife Kristen, both of Albuquerque, Christy Talbert and husband Frank of Aurora, Colo., and Michael Prell and wife Jenni, Katey Prell and Danielle Prell, all of Carlsbad; eight special great-great-grandsons, Jayden Prell, Eli and Grayson Prell, Vincent and Sylas Turri, Max and Oliver Turri, Gabriel Talbert, and baby Grace Elizabeth Talbert on the way; and numerous nieces and nephews. She was preceded in death by her husband, F.L. Green, in 1962; her parents, J.S. and Maude Gashwiler; sisters Baby Katurah Gashiler and Louise Schille; brothers Baby Howard, John, Jay, Robert and Frances Gashwiler; and two grandsons, Baby Haldeman and Daniel Haldeman. In lieu of flowers, the family requests memorial donations be made to the PEO Sisterhood, Chapter J, 1404 W. Sears Ave., Artesia, N.M., 88210; or the DAR, Mary Griggs Chapter, 2505 Sierra Vista Road, Artesia, N.M., 88210.